Antibiotic-resistant bacterial infections are one of the biggest threats to global health. Meanwhile, there is an equally alarming decline in development of new drugs to treat these infections. Therefore, there is a tremendous global need for effective therapies and prevention for infectious diseases. In a paper just published in Nature Biomedical Engineering1, we combined two concepts to increase the efficacy and reduce side effects of antibiotics: encapsulation into nanoparticles and targeted delivery to the infected tissue. The origin of this work was a grant from the Defense Advanced Research Projects Agency (DARPA) to a consortium of long-time collaborators, Drs. Michael Sailor at the University of California, San Diego, Sangeeta Bhatia at the Massachusetts Institute of Technology, and Erkki Ruoslahti at Sanford Burnham Prebys Medical Research Institute. The initial task was to develop a platform technology for the delivery of therapeutics to infected brain injuries by peptide-guided nanoparticles. Dr. Ruoslahti, Sazid Hussain’s mentor, had been employing in vivo phage screening to identify peptides with homing properties to diseased tissues in several conditions, particularly in cancer. They have shown that coupling of drugs or drug-carrying nanoparticles to such homing peptides enhances the delivery of an anticancer drug to tumors, increasing treatment efficacy and decreasing side effects2. This method was adapted to brain injury targeting. The second element, porous silicon nanoparticle technology, was developed in Dr. Sailor’s laboratory, where Jimmy (Jinmyoung Joo, co-first author) worked. The goal of developing an agent for peptide-directed delivery of therapeutics to the injured brain by nanoparticles was to encapsulate the therapeutic agents into nanoparticles coupled to an infection-targeting peptide uncovered from the previous screen. We successfully completed this task by demonstrating delivery of siRNA for gene silencing at the injured site in mouse brains using the peptide-targeted porous silicon nanoparticle platform3. At that point, the DARPA program changed the focus of our project from infected brain injuries to more general targeting of antibiotic-resistant bacterial infections. Thus began our search for new targeting peptides for drug-resistant S. aureus for nanoparticle-based antibiotic delivery. We screened a phage-displayed peptide library in a S. aureus-induced pneumonia model. The library was constructed to express cyclic 9-amino acid peptides of the general structure, CX7C, where X is any amino acid and C is cysteine. Two considerations were important in planning the strategy: we wanted phage that are maximally effective in targeting bacteria as they are in infected tissue, which is not necessarily the same as bacteria in culture, and we did not want phage that might target possible secreted bacterial products4 in healthy tissues as this would generate background signal from healthy tissue. To secure the desired result, Sazid used a combined in vivo/in vitro screening strategy. After some initial difficulties with the in vitro screening on cultured bacteria, capturing the bacteria onto magnetic beads coated with an antibody against the S. aureus gave us the best results for selecting for staphylococcal binders while eliminating any background from healthy tissue. After sequencing the phage pools recovered from in vivo screening, to our surprise, there were no dominant clones among the thousands of sequences. Here Erkki’s experience and unique ability to see recognition motifs came to our rescue. We noticed that there was a 4-amino acid sequence motif that was shared by many of the peptides. We constructed a 9-amino acid cyclic consensus peptide based on these sequences, the CARG peptide, with ARGG as the S. aureus binding motif. We synthesized a fluorescently-labelled peptide (FAM-CARG) and tested the binding on S. aureus in culture as well as in the lung and skin infection models. The results from the peptide binding and homing to site-of-infection in the lung and skin made us very happy: the peptide was potent and specific (Fig.1)1. Figure 1. CARG peptide shows selective binding to S. aureus in vitro and homes to infected lungs in vivo. Binding of FAM-labeled CARG peptide to the methicillin-resistant S. aureus (MRSA) strain US300-0114 in vitro (left). The homing of FAM-labeled CARG peptide intravenously injected via the tail vein to a mouse with S. aureus lung infection (right). The FAM signal (green) shows strong homing and uptake in regions of Staphylococcal infection (red). The merged confocal image shows co-localization of the CARG peptide with bacteria at the infection site (orange). Cell nuclei in the tissue are stained with DAPI (blue). Adapted from ref.1; Macmillan Publishers. 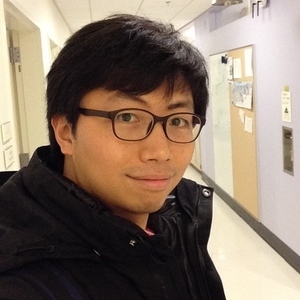 Jimmy was a postdoc in Dr. Sailor’s lab interested in developing translational nanomedicine. Previous work from Dr. Sailor’s group had demonstrated efficient drug delivery with therapeutic efficacy using peptide-targeted porous silicon nanoparticles (pSiNPs)5,6. As Jimmy had already established and optimized the methods for loading the antibacterial drug vancomycin into the pSiNPs, with the targeting peptide at hand he worked on fine tuning a peptide-guided pSiNP drug-delivery system to achieve high drug load at sites of S. aureus infection (Fig. 2). Figure 2. Schematic representation of the study. CARG peptide was identified by in vivo phage display in S. aureus infected mice. 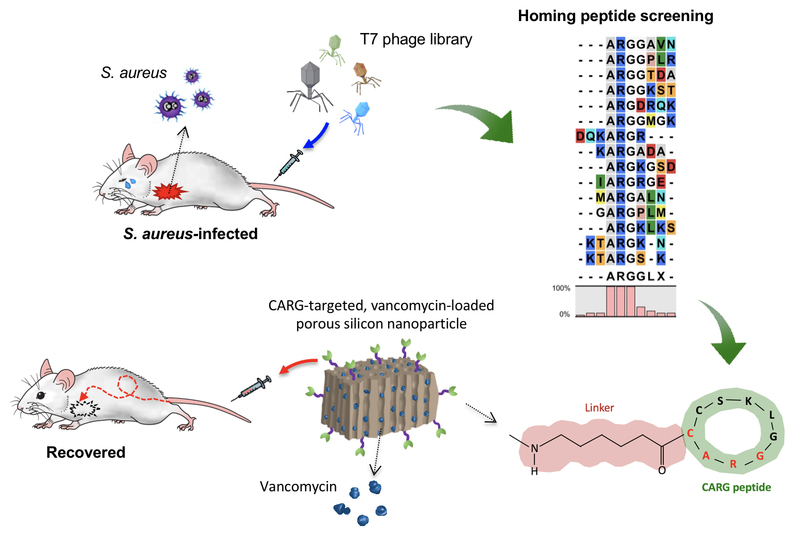 CARG guided the antibiotic-loaded nanoparticles to infection site upon systemic administration, resulting in enhanced antibacterial efficacy and cure. Adapted from ref.1; Macmillan Publishers. The peptide-guided vancomycin-loaded pSiNPs were 10-times more effective in treating S. aureus-induced lung infections than free vancomycin. The gains in efficacy can be advantageous in reducing the overall amount of drug administered, which will reduce side effects. 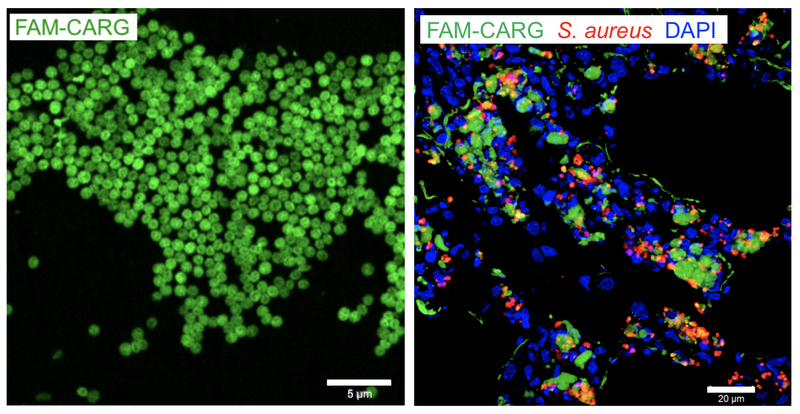 More generally, this study shows that the CARG-targeted pSiNPs can be used for systemic delivery of anti-bacterial drugs. Such peptide-targeted nanotherapeutics may represent an important advance in the management of difficult-to-treat infections. This project was only possible through the contributions from all the authors. As biomedical sciences become increasingly multidisciplinary, a strong emphasis should be placed on collaborations between biologists, chemists, engineers, and clinicians. This paper is an embodiment of such a collaborative effort. Written by Sazid Hussain and Jinmyoung Joo. Our paper: Hussain, S.,* Joo, J.,* et al., Antibiotic-loaded nanoparticles targeted to the site of infection enhance the antibacterial efficacy. Nat. Biomed. Eng. (2018) doi:10.1038/s41551-017-0187-5. * Authors contributed equally to this work. 1. Hussain, S., Joo, J., et al. Antibiotic-loaded nanoparticles targeted to the site of infection enhance the antibacterial efficacy. Nat. Biomed. Eng. (2018) doi:10.1038/s41551-017-0187-5. 2. Ruoslahti, E. Peptides as targeting elements and tissue penetration devices for nanoparticles. Adv. Mater. 24, 3747-3756 (2012). 3. Mann, A.P. et al. A peptide for targeted, systemic delivery of imaging and therapeutic compounds into acute brain injuries. Nat. Commun. 7, 11980 (2016). 4. Thammavongsa, V., Kim, H.K., Missiakas, D. & Schneewind, O. Staphylococcal manipulation of host immune responses. Nat. Rev. Microbiol. 13, 529-543 (2015). 5. Park, J.H. et al. Biodegradable luminescent porous silicon nanoparticles for in vivo applications. Nat. Mater. 8, 331-336 (2009). 6. Kang, J. et al. Self-sealing porous silicon-calcium silicate core-shell nanoparticles for targeted siRNA delivery to the injured brain. Adv. Mater. 28, 7962-7969 (2016).